Oh dear, this is an injustice. I thought this was posted 2 days ago! If you don't follow Ico Traders on Facebook, you now have ONLY today to take full advantage of the sweet deal that Miranda from Ico traders has offered up to us all on her birthday..... A whopping 50% off furniture and lighting! That's incredible!! 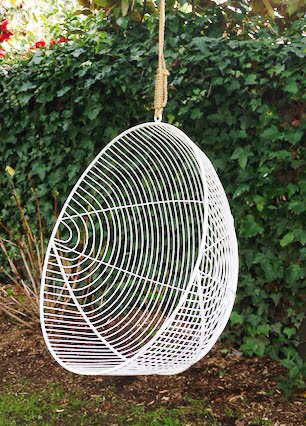 I have so many picks, but in my eyes the hero piece is this incredible hanging chair! Miranda worked on the design of this and got it just right, she has a love for hanging chairs and I share that love. In fact we sometimes had conversations soley about hanging chairs. Go and spend an hour on her website and get anything that needs getting, but if I were you I wouldn't be missing out on this beautifully formed fella. He will be hanging at my house on Christmas Day. I may not have lined walls or fully functioning bathrooms but I WILL have this chair.